"Put more spin on it!" Do you know the meaning of "on target"? It ain't rocket science. I only hold up one finger 'cause we only got one play. Mr. President... you're supposed to pitch the ball to me, not the second baseman. 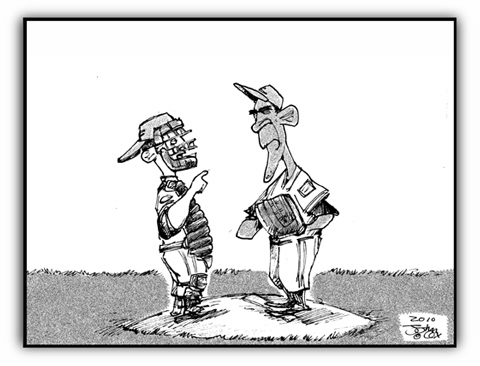 Mr President... in baseball, the catcher is to call the pitches, not the pitcher. it's no way to pitch!" "Look, Sir, you can't keep blaming the previous pitcher, throw a strike once in a while yourself!" "Forget about the other team. There's a rumble going through the stadium that the CROWD is about to storm the mound." "I'm trying to figure out whether you throw more like a girl or a Muslim." "Don't you already have a job you aren't even remotely qualified for?" "Let's try pretending you're slinging mud at George W. Bush, Fox News, BP, & Wall Street executives who used your bailout money to give themselves big bonuses." "Why don't you say something nice instead of being a smart-a__ all the time? This is a big f___ing deal here! I mean, you're the first mainstream African-American who is articulate and bright and clean and a nice-looking guy... I mean, this should be a storybook, man! We got our stimulus, we got our economic recovery bill, & there’s no possibility to restore 8 million lost jobs. Man, we're melting down worse than Howard Dean! We're going to Puerto Rico--we're going to Mexico--we're going on an apology tour--we're tearing down the country--YEARGGGH!!!" I've caught Strausberg and you, sir, are no Strausberg. That "change-up we can believe in" just isn't working for you. I didn't say, "SCREWBALL"! That came from the bleachers! If you pull this off, they'll ALL call you Messiah! Hey, boss, look what I found in my nose. Okay, baseball is a lot like picking a Supreme Court justice. If you throw an easy pitch, they wrong runner gets to first base and then makes a hard left. "ethanomx: "change-up we can believe in"
4 rubber chickens for ETHANOMX--& it only took him 1 trip to the mound. "The ump refuses to call them like you see them." "I once said, 'All pitchers are liars or crybabies'. In your case, I meant 'and' instead of 'or'." "I wish I had an answer to that because I'm tired of answering that question." "The future ain't what it used to be. Thanks a lot, you sorry b_____d." Just think of it as November and it's time for a change-up. This page contains a single entry from the blog posted on June 28, 2010 5:05 PM. The next post in this blog is Liquor Label Illustration Idea.